Pregnancy pillows provide comfort and support to women once they reach a stage in pregnancy when it is difficult for them to find a comfortable sleeping position. If you have already given birth to a child, you will know what I mean! It’s all OK for a while, but as your abdomen increases in size, you find it increasingly more difficult to lie down comfortably. Eventually your baby reaches a size where he or she needs more room to rest in – and so do you! You find it uncomfortable to lie down and try to sleep. Eventually you do find your best sleeping position, perhaps on your side. Then you get worried about how this will affect your baby. Is he lying in a safe position? Will you move and lie on top of her? What can you do? What’s the answer? A pregnancy pillow! A pillow designed for women throughout their pregnancy. So what is that? What are pregnancy pillows? Pregnancy pillows are not the same as the pillows you use to rest your head when sleeping. The term ‘pillow’ here refers to the cushioning of your growing child at an important stage of his or her life. Such pillows are designed to conform to your body shape when you are pregnant. Not just for your head to lie on, but to support your head, shoulders, back and most importantly, your growing abdomen. Your body shape changes when your child grows (obviously you may say!). Slowly at first, then with the speed of an express train – or so it seems! A pillow designed specifically for pregnant women will support your hips, stomach and back. We have carried out some research into how expectant women tend to sleep, and found that most prefer to sleep on one side or the other. We have also researched how best to support the mother-to-be and her unborn child. The following are the five best pregnancy pillows we have come across. * Thickness not stated and each leg said by users to be 10.5” – 11” wide. The Moonlight Slumber Comfort-U body support pillow is a pregnancy pillow that helps support your growing baby while you rest, relax and sleep. It makes sure that your neck, shoulders, hips and back are all correctly aligned while also supporting your ‘bump’ as it grows into a full-term baby. It is included our best five because of the way it keeps you cool at night while keeping your body stable in bed. While the padding inside this pillow is a synthetic down, the pillow case, or cover, is made with 100% cotton. It has no odor, and is hypoallergenic. It also resists dust mites and is good for those with allergies and sensitive skin conditions. The stuffing of the Moonlight Slumber Comfort-U pregnancy pillow is made from what is referred to as an ‘extended polymer’. This is a type of polymer than allows air to flow freely through it while it supports your weight. This leads to a cooler sleep so you don’t wake up in the night sweating. It is easy to clean and the entire pillow can be machine washed if required. The cover can also be removed for washing by itself. The length is quoted by users as being from 66 to 68 inches long, with each ‘leg’ 10.5” – 11” wide. Hypoallergenic and safe for new mothers to use – both during and after pregnancy. New covers available to purchase from manufacturer. Made in USA using safe high quality materials. Some commented on the integrity of the stitching or quality of the cotton, leading to tearing of the cover. Others believed to be too large. Editor’s Notes: Like most pregnancy pillows, some people believed this pillow to be too large. Pregnancy pillows are made intentionally large so that it can support your body from your head to your hips or knees. 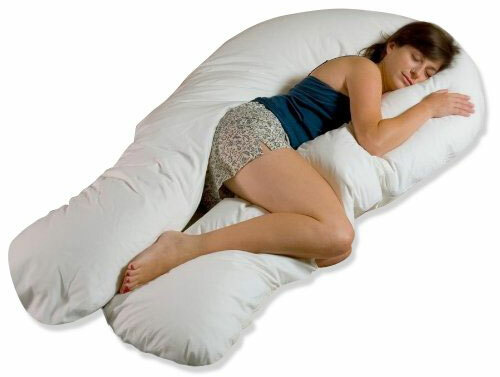 Pregnancy pillows are generally around 60 inches in length, and this one at 66 inches should suit most women. This pregnancy pillow supports your expanding belly well, and helps maintain a stable sleeping position throughout the night. This is #1 because of its length and its construction – the polymer padding not only supports your weight, but also allows a good flow of air to cool you during the night. The ComfySure U Shape Full Body Pregnancy Pillow is designed to provide the necessary support for pregnant women. Even if you are not pregnant, it supports your side and your back. Side sleepers will feel more comfortable with good support for their expanding abdomen. Its design also helps relieve back and hip pain. It can be used anywhere to relieve pressure: on your bed, while watching TV or reading. It can also relieve the pain of sciatica and back problems. This pregnancy pillow is made using 100% hypoallergenic polyester, and also offers a good resting place for your infant while feeding or nursing. It is ideal for anyone suffering allergies and sensitive skin conditions. When sleeping, it prevents your body from changing position –important when you are in the later stages of pregnancy. However, if you want to change your position, it is easy for you to consciously turn over. Some has issues with its weight size – at 10.8 lb it’s the heaviest of those we reviewed – though this adds to its stability. Only a very few people were worried by the weight. Editor’s Notes: ComfySure U shape full body pregnancy pillow is bulky. However, its bulk adds to its stability, and ability to help you maintain your position when sleeping. 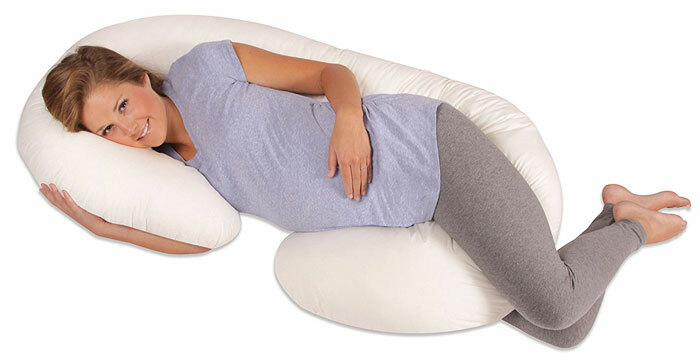 This pregnancy pillow can also be used for lying down reading, watching TV or just having a nap. It offers excellent support no matter what sleeping position you prefer. Many people use this pillow to help reduce the pain of sciatica, and it also helps those with gastric reflux fibromyalgia and recovering from surgery. This was almost given the #1 position, and only the country of manufacture made the difference: USA vs China. Many Chinese goods are of very high quality, and this is one of them. The Hiccapop Pregnancy Pillow Wedge for Maternity is an ideal solution for the discomfort many pregnant women feel when lying in bed. Unlike most such pregnancy pillows, it has two sides to it: One side firm and one side of plush memory foam. It will suit you over all three trimesters of your pregnancy. You can also use it after pregnancy until you feel ready for a regular pillow and mattress. Some women would like to use it all the time – Ok if you are single! It comes in the form of a wedge. You lie to the thin side of the wedge on your regular mattress, and your belly is supported by the thicker side. Many women find it to be the ideal solution to pregnancy discomfort while others prefer the regular type of C or horseshoe shaped pregnancy pillows. 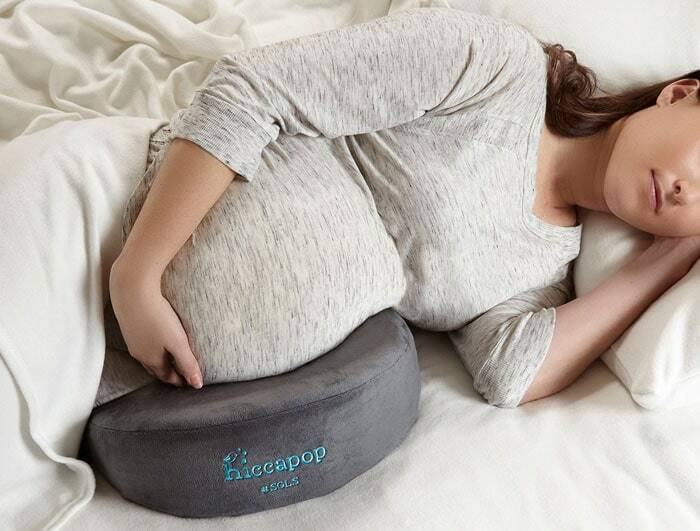 With the Hiccapop Pregnancy Pillow Wedge, you can sleep on your regular pillow with the Wedge supporting your unborn child. 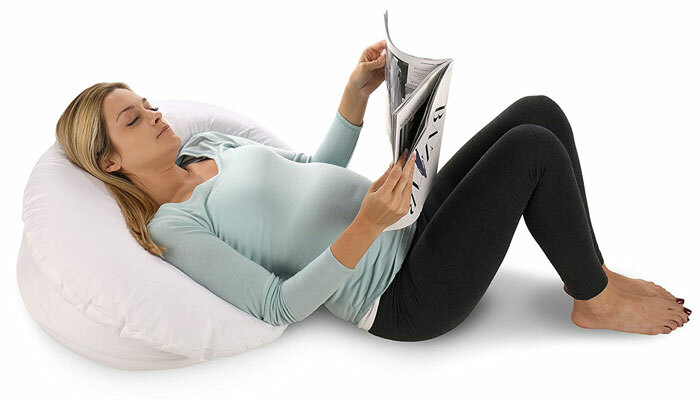 This pregnancy pillow helps relieve stress and swelling (edema) in your feet, hands and legs. The belly wedge is very versatile and you can also use it as a knee or a back pillow. The plush velboa cover is unbelievably comfortable, and is also removable and washable. 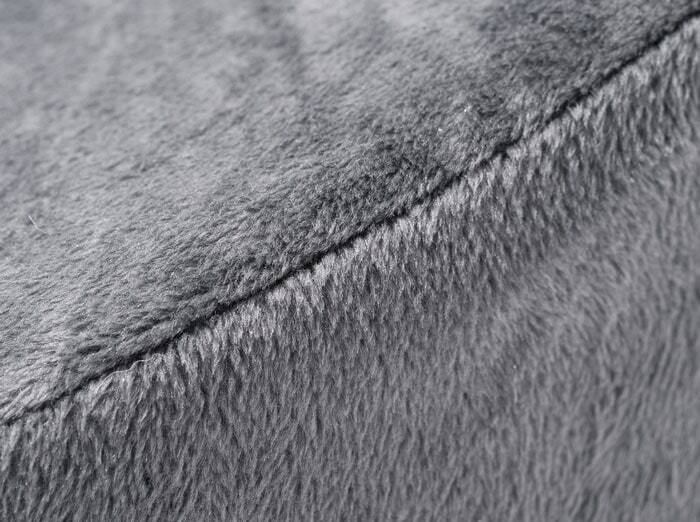 Velboa is a super-soft comfortable furry fabric and is safe for children – so it’s safe for you! The perforated layer of foam allows a good flow of air through it, and therefore keeps you cool at night. Very comfortable with two sides of different hardness levels: one soft and one hard to suit your needs. Compact and can be easily portable in the carry bag provided. Ideal if you find larger, regular pregnancy pillows unsuitable for you. The 3% who provide 1-2 star reviews feel the wedge is not sufficiently supportive. They would likely have preferred a regular pregnancy pillow. Editor’s Notes: I found it difficult to decide where to rate this in the five listed. It was almost #1, but because it is not a regular type of pregnancy pillow, I put it in the middle at #3. However, most happy users may have expected it to be listed first. It is not a regular design of pregnancy pillow in that it is a pillow only for your developing baby. You sleep as normal with the Hiccapop Pregnancy Pillow Wedge under your belly, supporting your ‘bump’ as you sleep on your side. Most users thought it brilliant! The Leachco Snoogle Total Body Pillow has been designed to follow and support the natural contour of your body as you sleep. You can use this pillow even of you are not pregnant. That is because it offers excellent support for areas of your body that would just flop and lie on your mattress unsupported. In fact, many overweight people find that a pregnancy pillow helps them sleep better due to the support provided. The Leachco Snoogle Total Body Pillow has a head pillow in the shape of a horseshoe. You can adjust its position and its height to match your own needs. Once the head section is right for you, the mid section offers you support for your tummy or your back, according how you prefer to sleep. Most sleep on their sides, but if you sleep on your back then the Leachco Snoogle Total Body Pillow will work for you. The end is slightly curved, and can tuck between your knees to keep you comfortable all night. This Total Body Pillow not only cradles your tummy to keep your growing baby safe, but also helps you sleep better and get that rest that a mother- to-be needs. Supports your back, preventing lower back pain and sciatica. Help with temperature control for a cooler sleep. Cradles your tummy, protecting your growing child. Keeps your head up, helping to prevent heartburn, acid reflux and promoting healthy breathing. A cotton cover is available to purchase separately. Some complaints about the pillow being too hard, though others found this helped with support. Not easy to travel with – like just about all such body pillows. Body pillows for pregnant women can be difficult to adjust while lying on them. This is true just about all such pillows, so not specific to this brand. Editor’s’ Notes: This is an excellent way to protect your growing baby while also providing you with good quality sleep. Sleep is sometimes an issue for some women, and this is the ideal way to sleep in preferred position while properly supporting your abdomen, hips, back and head. 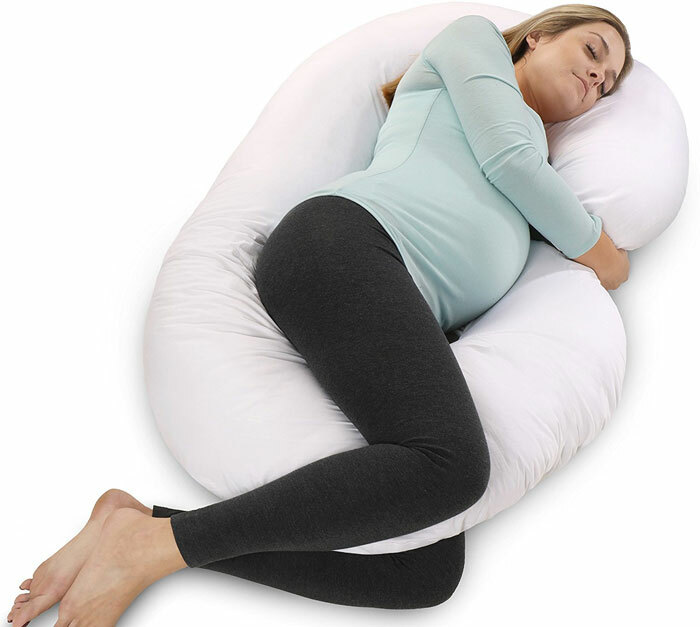 The cover supplied with the pregnancy pillow is polyester – and polyester does not breathe as well as cotton. However, you can purchase a cotton cover from the manufacturer separately if you prefer. 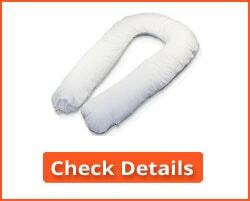 The PharMeDoc full body pregnancy pillow also gets good reviews. 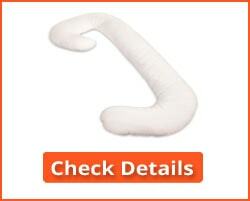 It is C-shaped pillow that supports your head, neck, back and hips – and also your abdomen. It is ideal for pregnant side sleepers, and can also be used as a nursing or feeding pillow once your baby is born. The pillow cover is zippered and easily removed for washing. It is machine-washable and hypoallergenic with no phthalates or toxic heavy metals. It is latex free with a lifetime warranty. The filling is hollow fiber polyester. The C-shape design provides comfort and support, particularly for side sleepers. Replacement covers are available for this pregnancy pillow. C-shape supports all pressure points plus your developing child. Some complaints about poor quality seams and other finishing. Editor’s Notes: This appears to be an excellent full body pillow for pregnant women. However, some complain about the standard of finishing. Because it is made in China you cannot contact the manufacturer direct. Chinese products can be very high quality, and 76% of buyers rate this pregnancy pillow very highly. Choosing the best pregnancy pillow is not easy. As often happens, you take some advice from friends and relatives and purchase something that was good for them – but not for you! The most expensive pregnancy pillow might not be suitable for you, so you can’t buy on price. However, it could be that your budget is a limiting factor. In that case, go for the best you can get with the money you have available. Our list above covers a wide price range and you are sure to find something that suits you. How do you choose a pregnancy pillow? Here are some of the factors you should consider before simply buying what your friend bought or what the reviews tell you should buy. It is always best to be informed before you buy, and the following guide should help you. Pregnancy pillows not only enable women to sleep in a comfortable position, but also in a position that is best for the unborn child. Consider your normal sleeping position. This may be on your stomach, your side or your back. Once you are noticeably pregnant, many believe sleeping on your stomach to be taboo! You will put too much pressure on the developing child. Pregnancy pillows are not solely for sleeping and can be used when you are relaxing, watching TV or reading – or even having a snooze. Their fundamental purpose is to support your growing baby – your bump. In the early stages of pregnancy, you won’t need any special form of support. However, once your baby grows, you will know yourself when some form of support is needed – particularly in bed. You will not need to be told what your recommended sleeping position is. It will be on your side. Not only may your back need some support but your bump certainly will. As your abdomen grows the need for support in bed increases, and you will likely find you could do with some support at other times during the day. A pregnancy pillow provides that support. One end of the pillow is usually situated under your head, or it can be under an arm. 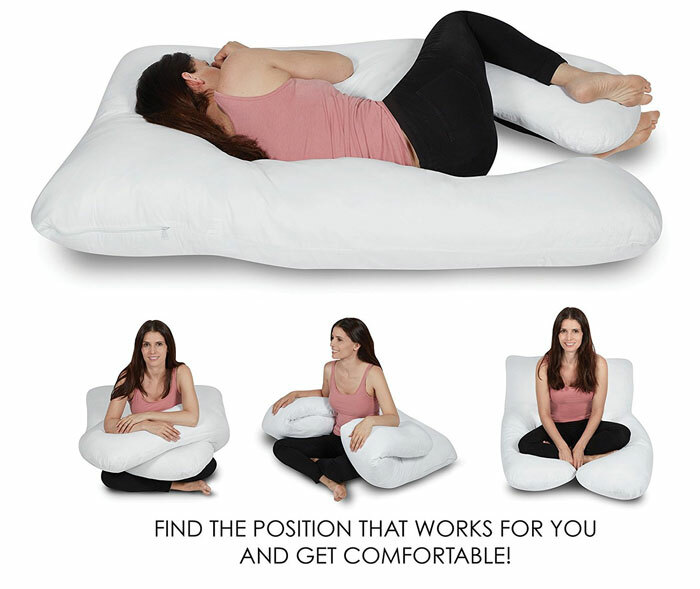 The other end fits between your legs, and the center of the pillow supports your abdomen and your growing child. That configuration helps you to stay in place and helps prevent you from changing position while you sleep. Most women find that they need to change the design of their pregnancy pillow as they grow. What works at 3-4 months may not work at 7-9 months. However, these pillows are not particularly expensive and are normally priced at from around $20 to under $200. Price is irrelevant in terms of comfort. Many low-priced pregnancy pillows are extremely comfortable and do the job perfectly. 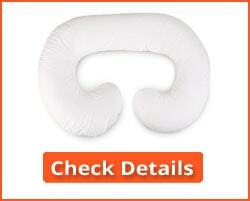 What factors should you take into consideration when choosing a pregnancy pillow? Keep in mind the reasons for you needing one: the most obvious are comfort and support. Here are some factors that you should take into consideration when choosing a pregnancy pillow. A pregnancy pillow combines the benefits of a regular pillow for your head while sleeping, a pillow to support your growing child and also a means of support to stop you moving around too much in bed. Your pillow should be comfortable for your head to lie on – just as any regular pillow. Not too hard, and nor should you sink into and feel smothered. Comfort is just as important with a pregnancy pillow as it is for a regular one. However, it should also support your body – your hips, shoulders and, of particular importance, your abdomen. The abdomen, or growing ‘bump’, is what a pregnancy pillow is all about, so that must be foremost in your mind. It should not be so soft that you just sink right into it (and get stuck when you want to move), nor so hard that comfort is sacrificed for support. The majority of pregnancy pillow covers are made using cotton or polyester, or a combination of both. Cotton breathes better than polyester and so can keep you cooler. The down material inside the pillow is also important. Some are formed using ‘extended’ or microcellular polyester that allows a good flow of air though its structure when you sleep. This keeps you cool, so look for this in the pregnancy pillow’s description. Make sure the pillow cover is removable for easy washing. Some pillows can be machine washed in their entirety – but make sure it is dried completely before using it again. If you suffer from allergies then hypoallergenic covers are best for you and your unborn child. There are several designs for pregnancy pillows. Most are body pillows, designed to support you from the head to the hips or even thighs and knees. Many are 60 or more inches long to facilitate this. Some are ‘C’ shaped while others are in the shape of a horseshoe, or a ‘U’. There are many others, so check them out and test them if you can. The design of pillow you need will depend on how you sleep, and where you need most support. It is also possible to find wedge-shaped pregnancy pillows. We have reviewed one of these above. They are inexpensive and simple. You lie on the narrow part of the wedge and your child rests on the thicker part. This is a good way of supporting your child, particularly when you are traveling. Not all pillows are the same. Just as will regular pillows, you should try it out before purchasing it. If you intend to purchase online, try to test a few in a physical store. It’s not so easy to so to do his as it is with a mattress. If you get the chance, it can give you an idea of the shape of pregnancy pillow you prefer. Even better – find a friend or relative who has one and check out theirs! Then buy yours online. The pregnancy pillows we have reviewed above are the best we have found, and they should all meet most needs. There are many others available, but these are the options that we have found offers most support for your growing baby while also keeping you comfortable in bed. 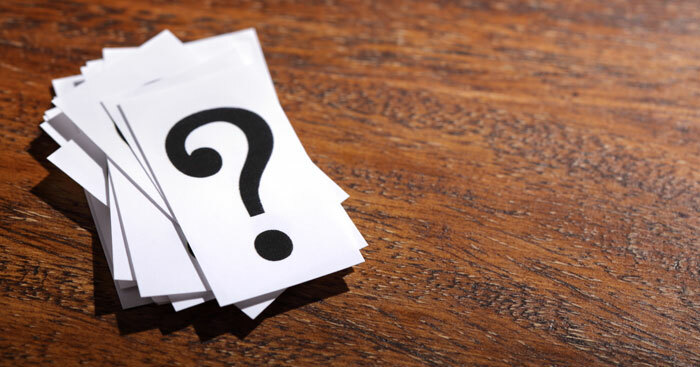 Here are some of the questions we have been asked regarding pregnancy pillows. 1. Are pregnancy pillows flippable? If you mean can you turn your pregnancy pillow over, then yes they are. 2. Can a pregnancy pillow help me be comfortable after my baby is born? Yes: It can support you, particularly when you are feeling tender. It can help you keep lying on your side while you sleep and support you where you need it. 3. Can a pregnancy pillow help me with feeding – I mean help me hold my baby while I feed her? One of the benefits of a pregnancy pillow is that it offers a great deal of support. You can lie with your baby while formula or breast feeding her and the pillow will support you. It will also support your baby daughter so both of you remain in a comfortable position until she has had enough. 4. Can I use my pillow for my baby to lie on? Will it help him from being sick after feeding? Your baby can certainly lie on your pregnancy pillow. It can support him and will help with reflux. Many babies seem to like lying in a pregnancy pillow. However, if your child is frequently sick, then you should get medical advice on the reason for it. 5. Can I use my pregnancy pillow after my child is born? I found it very comfortable to sleep with and wonder if it would be OK to use when not pregnant. I have a history of back pain in bed and pain in my hips and felt much better with this pregnancy pillow. Yes, of course you can. If you find the pillow relieves pain then there is no reason why you should not. In fact, many people use pregnancy pillows for therapeutic reasons – men and women.